The short story that opens the collection convinced me that I had picked the right book. “Passion Play” is an uncanny tale where the investigation of a mystery (the disappearance of a young girl) becomes the gateway to an even more mysterious story that revolves around a character that appears to have been deleted from an old, sacred icon. The story is immersed in an unsettling atmosphere; the mystery escalates and reaches a climax without being really resolved. “Two Brothers” uses the structure and style of classic Anglo-American ghost stories to craft a heart breaking tale that mixes the symbolic death connected to society’s initiation rites and the disturbing physical existence of something left behind during such process. Beautifully told, the story is narrated from the point of point of view of the younger of two brothers, who sees his adored older sibling becoming literally another person after he goes away to boarding school. The end, again, combines nicely real and metaphorical horror in a way that is entirely predictable but nonetheless very enjoyable. “Breadcrumbs” is an oneiric and decadent story, where the atmosphere of fairy tales is evoked but also twisted in a series of metamorphoses that involve an entire city, and, in particular, the people living in a metropolitan building. Lyrical and melancholic, “Breadcrumbs” seems to suggest that when change is inevitable, embracing it might be the most sensible approach, even in the face of the most surreal and incredible events. An unusual sci-fi story about colonisation, “Her First Harvest” is told in a style that reminds one of Jane Austen. The new colony, in fact, has recreated a society whose basic structures and consuetudes do not seem to differ much from those of a British provincial town in the 18th century. In the scenario imagined by Devlin, though, human bodies, both male and female, are used to seed mushrooms and other living crops, as the new land itself is hopelessly barren. Besides the curiosity of exploring the interaction between a topic and a literary style that are not usually matched, and besides a certain feeling of unsettlement (that in my case was pretty much real disturbance, but that’s just me being extremely squeamish) at the idea of the human flesh used as an incubator for precious plants, the story fails to make a meaningful point and didn’t really leave a real mark in my memory. “We All Need Somewhere To Hide” is a really weird story, and not just as definition of genre. In this case in particular, Devlin is very good at sketching a believable background for the main action, providing depth and motivations to his characters. Alce, the protagonist, is a professional exorcist, working with a quiet (but deadly) sidekick, and in collaboration with a slightly dodgy priest; the very same that used to work with Alce’s mom, a demon-hunter herself. In Alce’s line of business it is easy to make enemies, and very dangerous ones. Things get even worse when she ignores her dead mother’s advice and thinks she can get away with having something close to a normal life, and even a boyfriend. The story is bizarre but always oddly convincing in describing the characters feelings and reactions. The end is cynical, if not cruel, but perfectly consistent. I don’t want to give too much away, but this is the story illustrated by the catchy image on the cover (a pair of woman’s hands that seem to wear a man’s hand like a glove). “Dogsbody” tries to add some sort of social justice flavour to a classic werewolf story, exploring some of the practical troubles of someone who, in modern times, is suddenly moonstruck. The story touches prejudice and self-fulfilling stereotypes, but without really saying too much new about it. Possibly the most surprising story in the collection, almost to the point of being a little over the top, “Songs Like They Used to Play” starts as the account of what it looks like a mysterious case of time-travelling, but unravels to tell another, less scientifically challenging but still fairly unpredictable, story. The knowledge of the past that the young protagonist seems to display, actually comes from his participation, with his whole family, to a sort of historical Big Brother TV show. The boy and his parents and sister were filmed daily, living scripted lives in an historically accurate reconstruction of the 1930s. The reader is divided between the curiosity about the experiment, that is described with lucid realism in all its cringe-worthiness, and the empathy for the psychological repercussions that such an alienating experience is bound to have on a little boy. If you think there is more than enough for a SFF story so far, then be prepared for more surprises. The author has just started, and will throw in a mysterious club of fanatics of a very, very peculiar kind of music… The things going on are so many that I sometimes felt they made the story weaker instead of more interesting. Nonetheless, it remains a very enjoyable and memorable piece of writing. In “The Last Meal He Ate Before She Killed Him” Devlin explores again a different kind of literary style and a different nuance of weird. With language and atmospheres that recall Russian writers of absurd and grotesque like Gogol, the author tells the story of a woman who poisoned a cruel dictator. Her actions, though, didn’t end the tyranny, and the new oppressive government worships the deceased as a state martyr. To punish the rebellious woman, and to feed the cult of the dead dictator, the lethal supper is endlessly re-enacted for the benefit of distinguished visitors. The end is somehow predictable but it’s nonetheless well prepared, and doesn’t come as a disappointment. Although absolutely no supernatural element appears in this story, I would rate it as one of the most disconcerting. Another short story where the weirdness doesn’t really have any supernatural component is “The Bridge,” in which a young couple moves in a new house, where they find an astonishingly detailed model of the surrounding town, built by the late previous owner. The model-town though, does not look completely like the real place but mirrors the feelings and bias of its creator. The story is subtle and delicate. Just a whisper. Like something you are not entirely sure actually happened, or you just imagined. “The End Of Hope Street” is a very original and strangely captivating story, definitely a strong final chapter for this collection. The tale shows how a very small community deals with incredible and devastating events, in a mixture of passive acceptance and functional solidarity. People’s actions oscillate between nihilism and hope, exploring an interesting range of human feelings in the face of the inexplicable. Definitely a story that is not easily forgotten. Devlin seems to have a pyrotechnic imagination, and he’s able to firmly grab the reader’s attention from the very first lines of his stories (although he is not always as good at keeping the quality high through the entire story). He hops among literary genres and traditions without losing his personal style, achieving a pleasant variety that is very seldom found in single-authored collections. The prose is a pleasure to read, fluid but always precise. For being a male author, Devlin places a surprisingly (in a good way) high number of female characters in key roles, and is able to portray such characters convincingly enough. 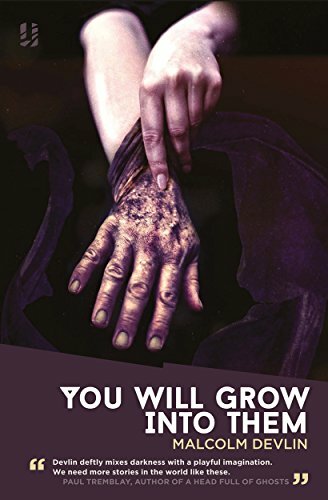 Although I had often the feeling that these stories somehow missed the chance to be truly excellent, this collection is definitely a fascinating read, full of strong and vivid ideas that exude a delightfully sinister charm. I look forward to reading whatever Devlin is going to publish next. Thank you for an interesting review. I’ve also read the book and found many of the stories to be extremely powerful. My own review is at https://wp.me/p7bXWk-1oQ. Devlin certainly has a gift for the uncanny.